What treaties that the whites have kept, that the red man broken? Not one.What treaties that the white man gave to us they kept? Not one. Sitting Bull (c. 1831 – 15 December 1890) was a Hunkpapa Lakota Sioux holy man and war chief, notable for his role in the defeat of George Armstrong Custer and the U.S. 7th Cavalry Regiment at the Battle of Little Bighorn. It does not take many words to tell the truth. What treaties that the whites have kept, that the red man broken? Not one. What treaties that the white man gave to us they kept? Not one. Behold, my brothers, the spring has come; the earth has received the embraces of the sun and we shall soon see the results of that love! Every seed has awakened and so has all animal life. It is through this mysterious power that we too have our being and we therefore yield to our neighbors, even our animal neighbors, the same right as ourselves, to inhabit this land. They claim this mother of ours, the earth, for their own and fence their neighbors away; they deface her with their buildings and their refuse. That nation is like a spring freshet that overruns its banks and destroys all who are in its path. We cannot dwell side by side. The love of possessions is a disease in them. These people have made many rules that the rich may break, but the poor may not! They have a religion in which the poor worship, but the rich will not! They even take tithes from the poor and weak to support the rich and those who rule. They claim this mother of ours, the earth, for their own use, and fence their neighbor away. ... If America had been twice the size it is, there still would not have been enough. You come here to tell us lies, but we don't want to hear them. If we told you more, you would have paid no attention. That is all I have to say. As recorded by reporters covering a speech made by Sitting Bull to U.S. military officers at a conference between the military and the Sioux who had retreated to Canada. Published in Utley, Robert M. The Lance and the Shield. New York: Henry Holt and Co., 1993. p. 196. I hardly sustain myself beneath the weight of white men's blood that I have shed. The whites provoked the war; their injustices, their indignities to our families, the cruel, unheard of and wholly unprovoked massacre at Fort Lyon … shook all the veins which bind and support me. I rose, tomahawk in hand, and I have done all the hurt to the whites that I could. Recorded by the Jesuit priest Pierre-Jean De Smet after a council with Sitting Bull on June 19,1868. Published in Utley, Robert M. The Lance and the Shield. New York: Henry Holt and Co., 1993. p. 79-80. I have killed, robbed, and injured too many white men to believe in a good peace. They are medicine, and I would eventually die a lingering death. I had rather die on the field of battle. Inside of me there are two dogs. One is mean and evil and the other is good and they fight each other all the time. When asked which one wins I answer, the one I feed the most. Look at me, see if I am poor, or my people either. The whites may get me at last, as you say, but I will have good times till then. You are fools to make yourselves slaves to a piece of fat bacon, some hard-tack, and a little sugar and coffee. Also told to Charles Larpenteur at Fort Union in 1867. Published in Utley, Robert M. The Lance and the Shield. New York: Henry Holt and Co., 1993. p. 73. I am nothing, neither a chief nor a soldier. This is a good day to die. Follow me! I will remain what I am until I die, a hunter, and when there are no buffalo or other game I will send my children to hunt and live on prairie, for where an Indian is shut up in one place his body becomes weak. I am here by the will of the Great Spirit, and by his will I am chief.… I want to tell you that if the Great Spirit has chosen anyone to be the chief of this country, it is myself. Because I am a red man. If the Great Spirit had desired me to be a white man he would have made me so in the first place. He put in your heart certain wishes and plans; in my heart he put other and different desires. Each man is good in the sight of the Great Spirit. It is not necessary, that eagles should be crows. For 64 years you have kept me and my people and treated us bad. What have we done that you should want us to stop? We have done nothing. It is all the people on your side that have started us to do all these depredations. We could not go anywhere else, and so we took refuge in this country. It was on this side of the country we learned to shoot, and that is the reason why I came back to it again. I would like to know why you came here. In the first place, I did not give you the country, but you followed me from one place to another, so I had to leave and come over to this country. I was born and raised in this country with the Red River Half-Breeds, and I intend to stop with them. I was raised hand in hand with the Red River Half Breeds, and we are going over to that part of the country, and that; is the reason why I have come over here. That is the way I was raised, in the hands of these people here, and that is the way I intend to be with them. You have got ears, and you have got eyes to see with them, and you see how I live with these people. You see me? Here I am! If you think I am a fool you are a bigger fool than I am. This house is a medicine-house. Yon come here to tell us lies, but we don't want to hear them. I don't wish any such language used to me; that is, to tell me such lies in my great Mother's house. Don't you say two more words. Go back home where you came from. This country is mine, and I intend to stay here, and to raise this country full of grown people. See these people here. We were raised with them. [Speaking of the Custer fight] There was a Great Spirit who guided and controlled that battle. I could do nothing. I was sustained by the Great Mysterious One (pointing upwards with his forefinger). I am not afraid to talk about that. It all happened it is passed and gone. I do not lie, but do not want to talk about it. Low Dog says I can't fight until some one lends me a heart. Gall says my heart is no bigger than that (placing one forefinger at the base of the nail of another finger). We have all fought hard. We did not know Custer, When we saw him we threw up our hands, and I cried, Follow me and do as I do. We whipped each other's horses, and it was all over. There was not as many Indians as the white man says. They are all warriors. There was not more than two thousand. I did not want to kill any more men. I did not like that kind of work. I only defended my camp. I never committed any depredations in the white man's country. I never made the white man's heart bleed. The white man came on to my land and followed me. The white men made me fight for my hunting grounds. The white man made me kill him or he would kill my friends, my women, and my children. It is not easy to characterize Sitting Bull, of all Sioux chiefs most generally known to the American people... The man was an enigma at best. He was not impulsive, nor was he phlegmatic. He was most serious when he seemed to be jocose. He was gifted with the power of sarcasm, and few have used it more artfully than he. ...It was said of him in a joking way that his legs were bowed like the ribs of the ponies that he rode constantly from childhood... It is told that after a buffalo hunt the boys were enjoying a mimic hunt with the calves that had been left behind. A large calf turned viciously on Sitting Bull, whose pony had thrown him, but the alert youth got hold of both ears and struggled until the calf was pushed back into a buffalo wallow in a sitting posture. The boys shouted: "He has subdued the buffalo calf! He made it sit down!" And from this incident was derived his familiar name of Sitting Bull. ...As he talked he seemed to take hold of his hearers more and more. He was bull-headed; quick to grasp a situation, and not readily induced to change his mind. He was not suspicious until he was forced to be so. All his meaner traits were inevitably developed by the events of his later career. 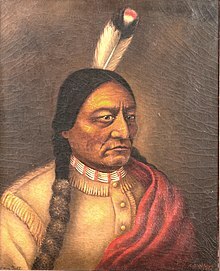 Sitting Bull joined in the attack on Fort Phil Kearny and in the subsequent hostilities; but he accepted in good faith the treaty of 1868, and soon after it was signed he visited Washington... [He] hoped [for] close adherence to the terms of this treaty to preserve the Big Horn and Black Hills country for a permanent hunting ground. When gold was discovered and the irrepressible gold seekers made their historic dash across the plains into this forbidden paradise, then his faith in the white man's honor was gone forever. After the Ghost Dance spread across the Rockies to the Plains tribes it ran amok. ...The fervor attacked the Plains tribes virulently, particularly the Sioux, who were at that time the largest and the most intransigent of them all. The Sioux had been forced to submit to a series of land grabs and to indignities that are almost unbelievable when read about today. ...they were being systematically starved into submission—by the White Bureaucracy—on the little that was left of their reservation in South Dakota. ...From Rosebud, the Ghost Dance spread like prairie fire to the Pine Ridge Sioux and finally to Sitting Bull's people at Standing Rock. The Sioux rebelled; the result was the death of Sitting Bull and the massacre of the Indians (despite their ghost shirts) at Wounded Knee in 1890. This page was last edited on 12 December 2018, at 19:36.